I hate that I’ve let my favorite activity fall by the wayside the past couple months, but I promise I had a good reason! Joseph and I bought our first home at the beginning of May. So we’ve been living in disheveled mayhem for a month or so prior to the move and then a month or so after the move. Things are finally calming down 🙂 So I wanted to give you all a heads up that my first blog post in a while will be hot off the presses in a couple of days. Even though I haven’t been on here blogging, I’ve still been cooking and taking A LOT of pictures. So I’ll be sharing quite a bit with you! Can’t wait!!! My best friend once said to me “no one would ever guess you drink like a fish.” This was not meant as a slight or condemnation of the amount I can (and do) drink. Rather it was an observation of how I do not look like I drink. And I admit that I pride myself on this. I work very hard to be healthy and in good shape while still allowing myself indulgences on occasion and drinking beer on many occasions. My girlfriends often ask me how exactly I do it. Well, that’s what this blog is going to be about. I am going to lay it all out there for you. ALL of it. I am going to detail what I eat, my workouts, my indulgences, and the beer. Beer isn’t even an indulgence at this point in my life. It’s a staple. Did I mention my husband works at a brewery? Right, soooo…yeah. 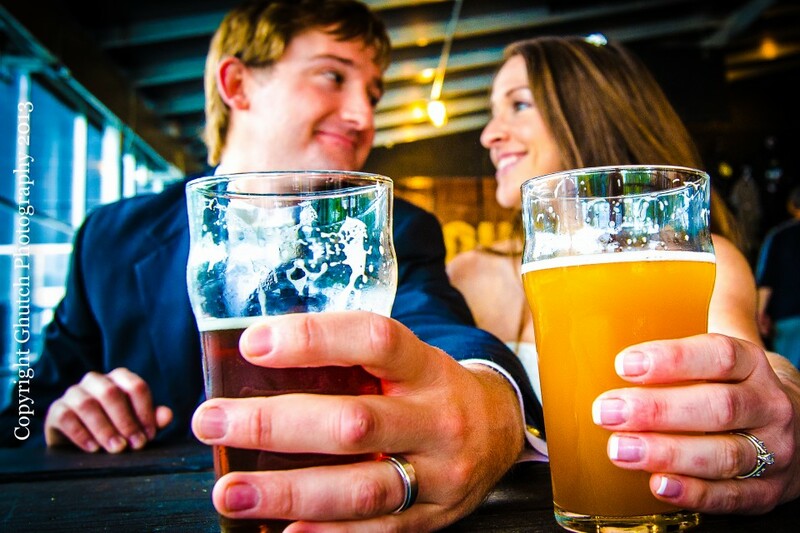 We love beer. But I do, in fact, love being healthy as well. I shop at Whole Foods regularly. Now I know what you’re thinking, that Whole Foods is ridiculously expensive and there’s no way you can afford to shop there. False. You simply have to shop smartly there. Really. I promise it can be done. I’ll tell you how I do that too. I work out quite a bit. It’s not always easy, and often times it is a struggle for me to get started. But usually once you get going it’s not too hard to keep going. And when you’re done, you generally feel great. And ready for a beer. After all you’ve earned it. I have a decent metabolism. Obviously this makes staying healthy and fit a bit easier for me than it can be for people with slow metabolisms. This blog should only be a reference for those of you trying to attain or maintain a healthy body while not giving up everything you love. But it is not to be used as rules that work for every single person. I have read A LOT of nutrition information over the years and I have tailored my lifestyle using what works best for me and delivers the results that make me happy. You will have to do the same thing. It will take time to find out what works best for you. What I can promise is that this is a good jumping off point. 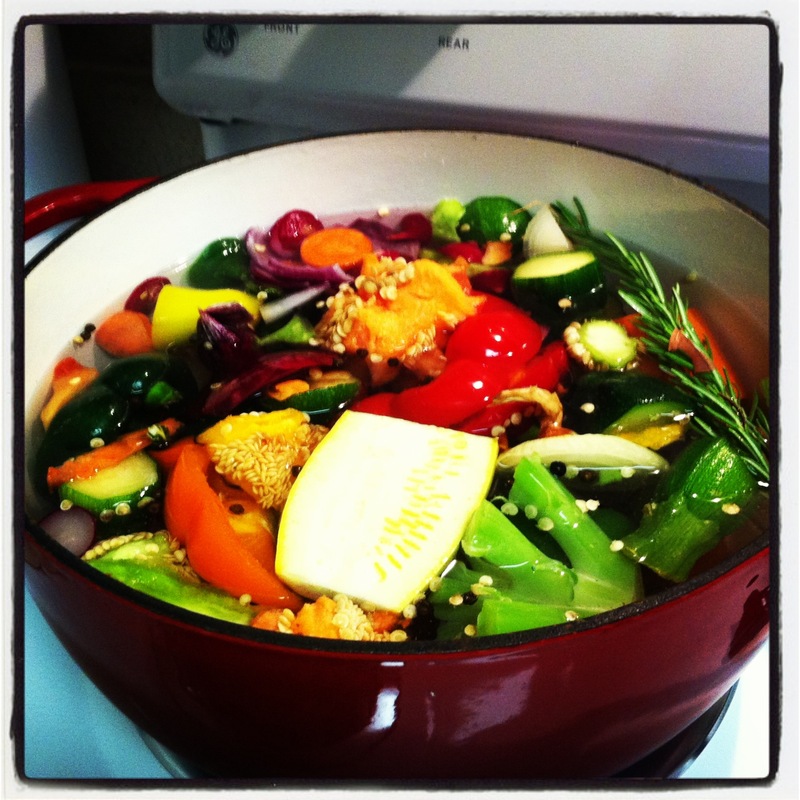 I want to share a couple of photos that I have on hand to illustrate the types of things I like to do in the kitchen. I would say about 70% of the time I bake muffins weekly for me and Joseph to have for breakfast. 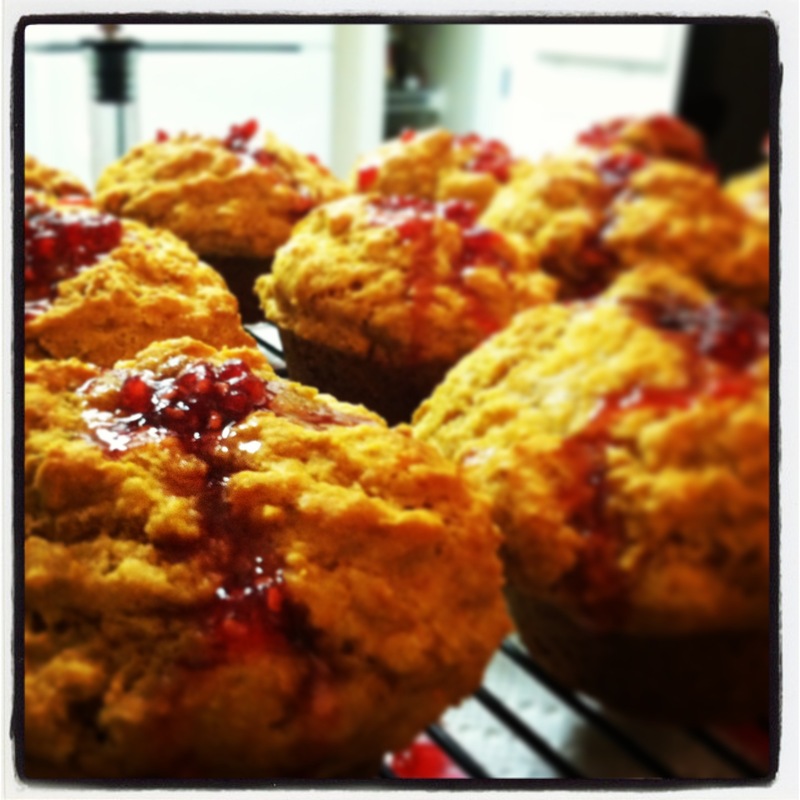 Below are some whole wheat and cornmeal muffins filled with a homemade raspberry jam. If we aren’t having homemade muffins we’ll typically eat cliff bars in their place, but we always have fruit and yogurt as well. I plan to provide detailed meal plans later, but this is just to give you an idea. Okay so I guess that’s it for our introduction. I’m making something new for dinner tonight using tomatillos from a coworkers farm. I’ll take pictures and tell you all about it. Before dinner I plan to do a workout, so I’ll let you know what that consisted of as well. And of course, there will be beer.